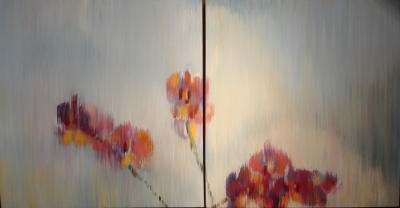 diptych, oil on panel, 48"x96"
Jill Hackney grew up in New Orleans where she attended the New Orleans Center for Creative Arts (NOCCA). She went on to study painting and drawing at Louisiana State University where she earned a BFA. Jill was also awarded a scholarship and spent a semester at the Cleveland Institute of Art where she studied painting. Upon completion of her BFA she worked as a photographer, floral designer, high school art teacher, and Leisure Course art teacher at Louisiana State University. She was a founding member and twice president of Studio 801, an artist cooperative in Baton Rouge, which exhibited tri-annually. She is currently working in the media of oil paint. Jill focuses on figure, still life, landscape and portraiture as subject matter for her work. 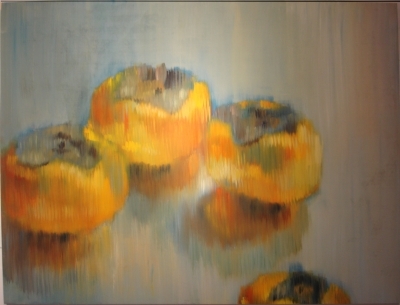 Jill currently exhibits with Ann Connelly Fine Art in Baton Rouge, Louisiana, Harris Gallery in Houston, Texas, Blue Gallery in Three Oaks, Michigan and Duane Reed Gallery in St. Louis, Missouri. When I see light on an object I see it in layers. I see not only the color of the object, but also the color of the light, direct or reflected and it’s impact on the object. 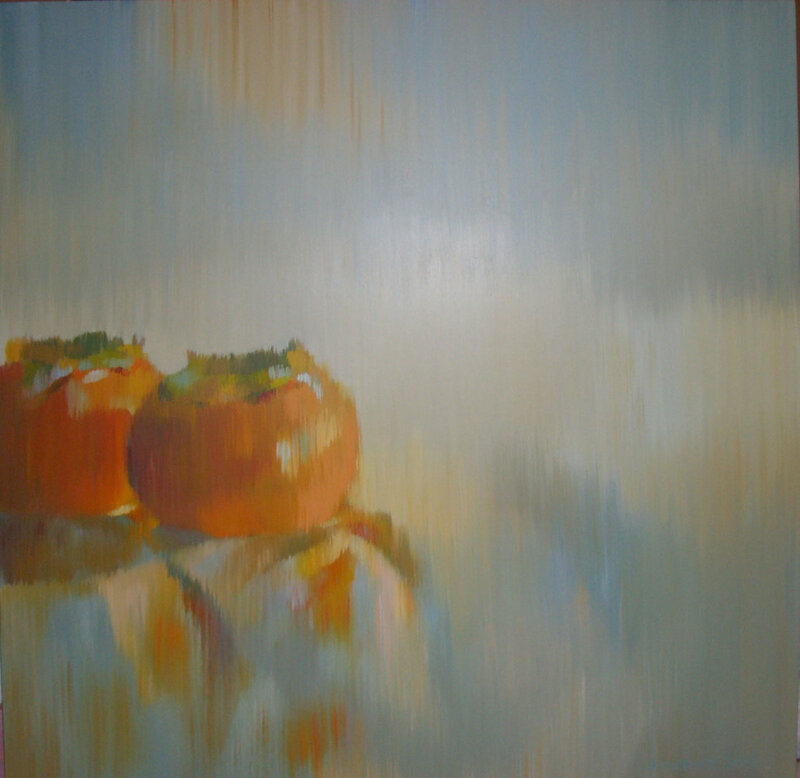 The light creates a connection in the composition, each object absorbing and reflecting, becoming a mirror of it’s surroundings. I strive to compose a vignette with a sense of a broader environment and a harmony of positive and negative space. I like to use unfinished boards to create my still life oil paintings. The natural texture of the wood often lending it’s own organic layer to the composition. The brushes I use are just simple bristle brushes which I trim. The brushes, feeling like an extension of my arm, leave their own mark which help to create the pattern I use to paint. My strokes are vertical and linear, I use these strokes to paint the total composition. 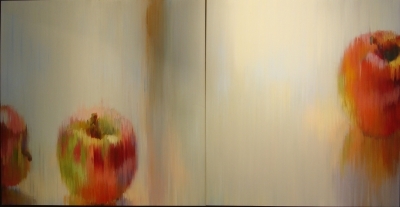 I have really come to enjoy applying the paint in layers, each giving more depth to the image. The layers build up lines of different colors which help me to express the layers of light which wash across the objects in my still lives. Every time I begin a new piece I am filled with both confidence and insecurity. Knowing I have created beautiful images, I believe I can get through each new painting, yet the process is always daunting. Creating a painting is like jumping off of a cliff and I must create a soft landing. I am always in awe of the work when I am finished. When the paintings are done they often evoke in me a feeling of nostalgia, watching the rain on a window pane, feeling the sunlight on a summer evening. Synaesthesia, simply, means a union of the senses, one sense inciting another. This seemed to fit well with my art, as for me, the beauty of the work always awakening feelings of joy, serenity and peace. To order any of Jill’s work please complete the form below stating Jill Hackney‘s name in the message area and I will contact you as soon as possible. Or call Judy Ferrara directly at 1-574-276-6001.